Nothing beats brass when it comes to power and performance in the yard and garden. The Sun Joe SJI-4BHN 4-Inch Solid Brass Heavy Duty Twist Hose Nozzle features reliable, smooth operation every time. Wash the car, water the plants or simply clean your siding - its the one nozzle that does it all! Spray adjusts from gentle shower to high-pressure stream in one smooth motion. Ensures maximum water pressure where you want it. Solid brass one-piece inner core resists damage, rust, leakage, and stands up to years of continuous use for reliable operation and a lifetime of dependable performance. Designed for the pros, this watering tool delivers the durability of die-cast zinc construction and comfortable, ergonomic handle for superior comfort and control. 4-inch Solid Brass Heavy Duty Twist Hose Nozzle Nothing beats brass when it comes to power and performance in the yard and garden. 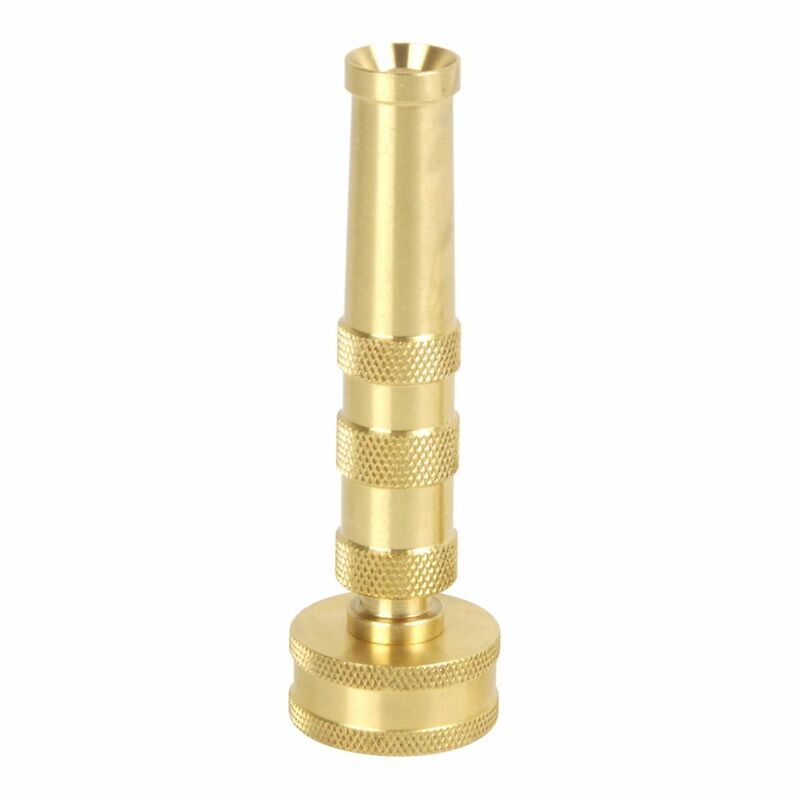 The Sun Joe SJI-4BHN 4-Inch Solid Brass Heavy Duty Twist Hose Nozzle features reliable, smooth operation every time. Wash the car, water the plants or simply clean your siding - its the one nozzle that does it all! Spray adjusts from gentle shower to high-pressure stream in one smooth motion. Ensures maximum water pressure where you want it. Solid brass one-piece inner core resists damage, rust, leakage, and stands up to years of continuous use for reliable operation and a lifetime of dependable performance. 4-inch Solid Brass Heavy Duty Twist Hose Nozzle is rated 4.7 out of 5 by 24. Rated 5 out of 5 by Mike from Twist hose nozzle works as expected.... Twist hose nozzle works as expected. Rated 5 out of 5 by EagleEye from No drips when twisted closed with water on full pressure.... No drips when twisted closed with water on full pressure. Only takes one-hand for holding the hose and twisting the nozzle at the same time. Nice smooth flow control. Works great and a good price. Don’t know how long it will keep working drip-free, but it seems well made. Rated 5 out of 5 by MMM from Great product no problems so far.... Great product no problems so far. Rated 5 out of 5 by Pauline from Really like it very easy to turn off and on... Really like it very easy to turn off and on and doesn't leak water. Rated 4 out of 5 by Anonymous from Good product for the price. Not sure why Home Depot... Good product for the price. Not sure why Home Depot stores don’t carry it. Had to order mine online. Highly recommended for home use. Rated 5 out of 5 by thomas from Fanstastic Nozzle solid brass nozzle is proven performer for over half a century. beats all the others. size &nbsp;3/4 &nbsp;or &nbsp; 5/8 ?